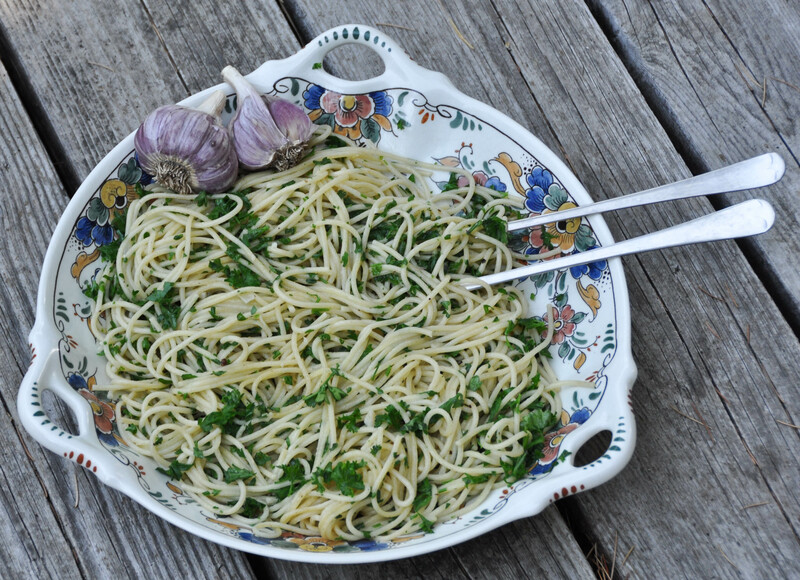 Our Nichols Garlic harvest is beautiful this year and what’s better to serve than pasta featuring fresh from the field garlic? This is a simple side dish, rich in garlic flavor and aromas, a good extra virgin olive oil and plenty of chopped fresh parsley. Preparation is the key to this recipe. First rinse and chop parsley then set aside so you can give full attention to past and garlic as they cook. Peel and chop garlic and set aside. Bring salted water to a boil and add pasta, gently stirring into water so it does not break or stick to pot. Take a large skillet and heat to medium low temperature. Add olive oil and garlic, gently cooking with no trace of browning. If it’s cooking too fast lift pan from heat and reduce temperature. Garlic is cooked only until soft ands aromatic. Cook pasta in boiling salted water for 8 minutes, until barely tender. Scoop from pot and add to skillet with parsley. Gently combine ingredients and serve piping hot with a grating of fresh black pepper. This is traditionally served without cheese but add if you like. Garlic can be increased to suit your tastes but always cook slowly as it is retains the rich garlic flavor and aroma. Sprinkle with few red pepper flakes for a light flavor burst.